"The classic 1980's hit... Ghost 'n' Goblins once again returns on the PlayStation 2!" If you can remember the original Ghost 'n' Goblins game, then you're probably either a first or second generation gamer. Originally developed for the arcades, Ghost 'n' Goblins was one of the most popular games of the time that not only spawned a few sequels but was ported to almost every home entertainment system of the time. The current incarnation of the series is called Maximo vs Army of Zin and immediately picks up where the last story finished. For those that wish to have a quick recap, the third instalment of the series entitled "Maximo: Ghosts to Glory" saw our brave hero slain and in order to save the world and find his beloved, he had to fight his way through the realm of Hades and return to the land of the living. Fortunately for Maximo, he met one of his greatest allies and friends along the way and that is Death himself or as legend calls him, the Grim Reaper. Upon returning, Maximo soon discovers that the Army of Zin has once again been freed and is causing chaos upon the world and it is up to Maximo to once again save the world and hopefully be reunited with his beloved princess, Sophia. 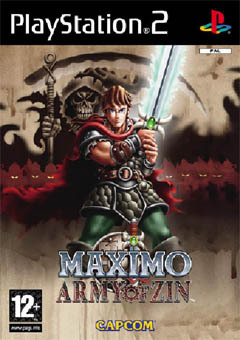 Maximo vs. Army of Zin (now known as Zin for this review) is a classic 3D arcade game that allows gamers to take control of the hero and perform a variety of manoeuvres from jumps, rolls, dodging deadly traps, solving various puzzles, defeating a plethora of enemies and of course challenging and hopefully defeating dangerous boss creatures at the end of each level. 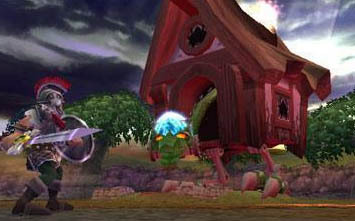 The combat system of Zin is similar to the previous game and Maximo's main attack is either a slice or a double attack with his sword. The developers have also included various combos into the battle system that allows Maximo to pull off unhuman and powerful feats in battle. Zin also pays homage to the original health system of Ghost 'n' Goblins where your main character is given three lives and each time you are hit, you lose a life. Although this makes for some exciting gameplay it also can be quite excruciating because if you near the end of a level or in the middle of a puzzle, you basically have to restart from the last check point. The game is also littered with various items and treasures that give you a variety of attributes and powers to assist you in your travels. Zin like all good arcade games (unfortunately) supports the stock standard arcade save system which means that you cannot save the game anywhere you like. For instance, the game is automatically saved once you have completed a level but fortunately there are a few checkpoints in the levels to ensure that you don't start from the beginning of the level each time you die. Capcom have also introduced vendors into the gaming environment that allow Maximo to purchase powerups that basically improves your equipment. This not only allows you to upgrade your weapons but also items such as shields and armour so that you can take on even the most seasoned of enemies. As with the previous games of the series, once Maximo gets hit, he loses a piece of his armour, until he is running around in his boxers... quite an amusing sight if I do say so myself. The gaming environment of Maximo is relatively huge and there are a plethora of traps, items, monsters and other nasty things hiding in each level. 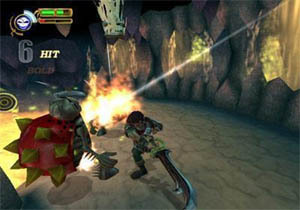 Although once you get to the end of the level, Maximo generally has to square off against a deadly boss character and their difficulty rating ranges from easy to extremely difficult. Graphically, Zin is a very sturdy yet cartoony looking game and features some well designed and detailed character models. Maximo supports a variety of realistic textures and enough reflective surfaces on his armour to make him appear as a hero out of legend. The enemies in the game, although rather simplistic when compared to Maximo are all well animated and move quite well with the gaming environment. The backgrounds in the game are all created from 3D polygons to give the game that dark cartoon atmosphere and match that with a variety of special effects and you have an extremely nice looking game. The lighting and weather effects of Zin truly proves that the PlayStation 2 is not an old dinosaur and obviously this platform still has a few years to go before it becomes dated. It should also be mentioned that the frame rate of Zin remains quite constant throughout the game and I've only noticed it chug on one or two occasions, so hats off for the developers on a job well done. The musical score of Zin not only pays homage to the original music of the series but has incorporated a new contemporary modern fill to it, in other words, it has been updated for the 21st century. The sound effects in the game contain all the sounds of battle from swords hitting armour to the deadly sounds of the enemies that Maximo encounters which helps immerse you into this wonderful world. The voice acting of Zin has been professionally done, although on occasions a little cheesy but this is what made games during the late 80's and 90's. In conclusion, Maximo vs. Army of Zin is a great sequel to the previous games of the series that was released two years ago and I would recommend this game to any arcade addicts that wants a fun and addictive title to play over the autumn days of hot and cold. 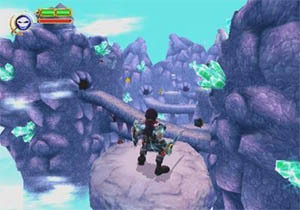 With an in-depth storyline and a sturdy gaming engine, Maximo vs. Army of Zin takes the arcade genre to the next stage. Capcom have done a wonderful job at fixing a lot of the problems from the previous game such as the bad camera angles and dodgy A. I., so if you felt the last game left a funny taste in your mouth, this as sure as hell won't! Check it out!